Things have been kind of slow in the kitchen but, as of yesterday, both soffits are gone. It was a messy job and a bit harder to do than we thought it would be because of the extra thick sheet rock, they were built to last for the long haul, but they are gone forever. The first one we did was the one with the 60-year-old light fixture and the clock electrical outlet. We added new insulation and sheet rock and now we are working on the spackle. This weekend we worked on the opposite wall, where the stove and refrigerator live. 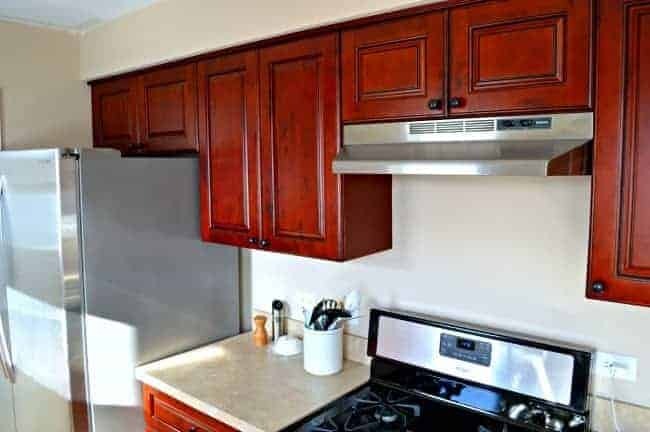 This picture is a really good representation of the color of the cabinets which are reddish-brown and very dark in my small, cramped kitchen. They were installed by the bank before we moved in so they are in great shape but they aren’t top quality (no idea who makes them because I can’t find a name anywhere). BTW, the cabinets will stay but they will be painted and reconfigured just a bit. 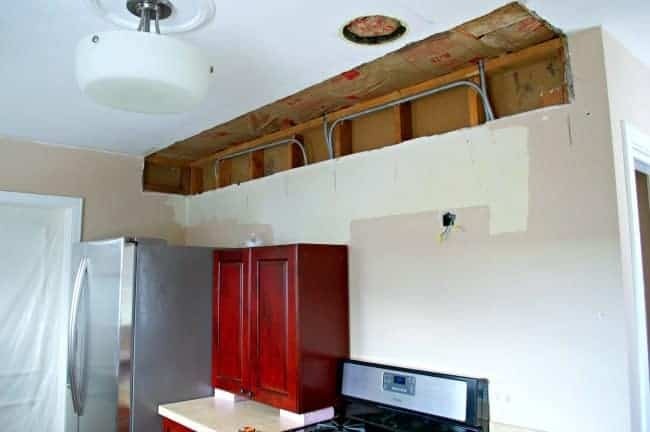 I just wanted to show you where the soffit ends and where the cabinets end on this wall. Drives. Me. Crazy. That 60-year-old fan is a greasy eyesore too. 2nd soffit gone (as well as that fan!) and ready for sheet rock, which we finished last night. 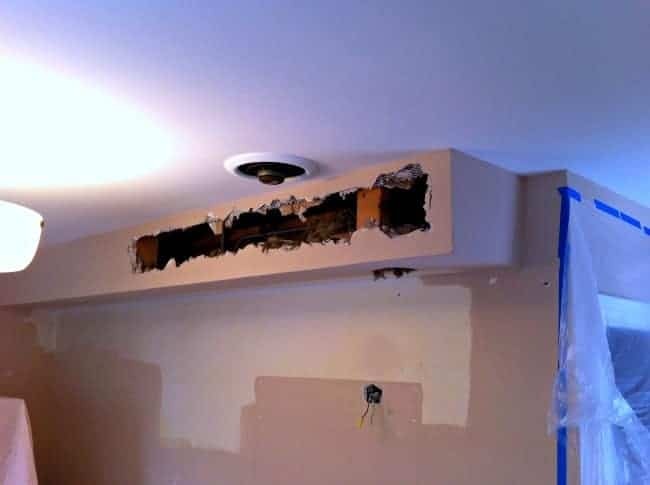 Spackling is next and then we will move on to the ceiling, which will have recessed lights and a ceiling treatment…maybe?…most likely? Things change every day so we’ll see what happens. Oh, and I finally set up my painting area and started the cabinets. There’s no turning back now. I feel like I should have more to show you but, since we are doing everything ourselves and the husband works another job, we do it when we can. 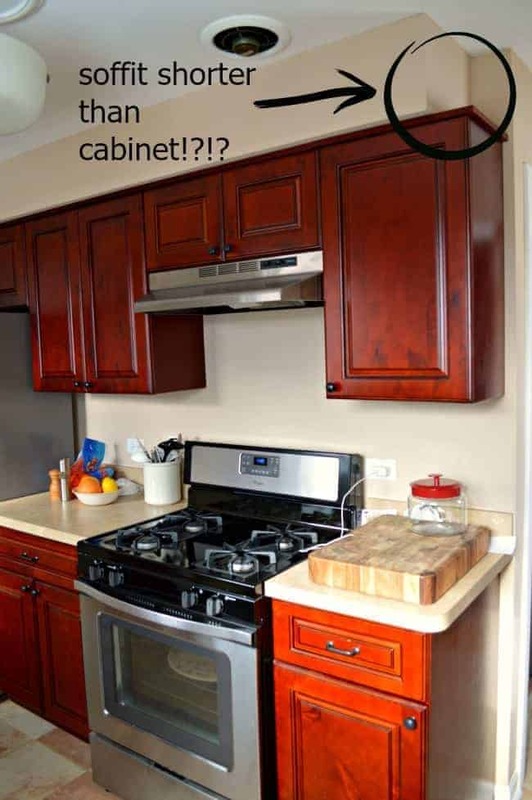 It’s not easy to cook though when most of the kitchen cabinets are in other rooms. I hope to have a post up later in the week about paint colors for kitchen cabinets and walls, I’m still debating on my wall color. I’m curious to hear what you think. Even though we aren’t removing walls and replacing cabinets, this is probably the biggest renovation we’ve ever done and I have to say that I’m loving the process. 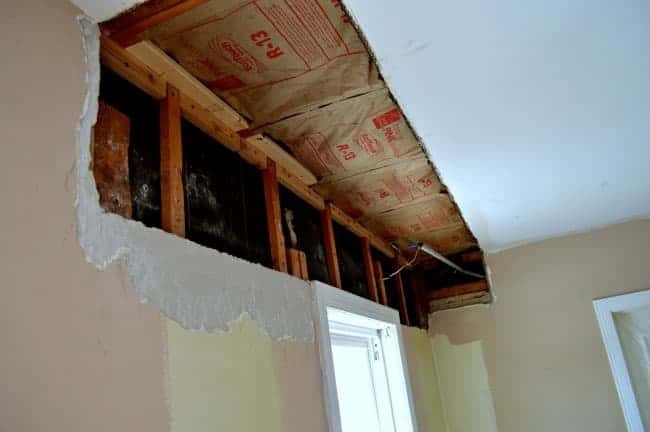 Have you ever done a big reno? How did you feel about it? I don’t blame you for hating the soffits. It was a big job but we are so glad that they’re gone. 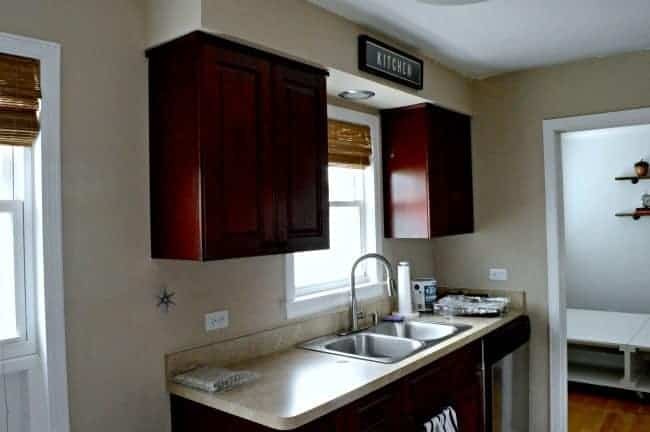 When you have a small kitchen, they really close in the space. If you ever take that sledge hammer out, I would love to hear about it. Doing projects on your own are hard work but it pays off in the end when you can enjoy your handiwork. Thanks for linking up at Thursday Favorite Things, please visit us again next week! Thanks so much to all of you for hosting such a fabulous party. I look forward to it every week. Hang in there this is the messy part. The first kitchen that I redid we did all the demolition including removing cabinets, soffits, flooring and a wall. Then I had a contractor install the drywall, cabinets. Of all the details in finishing I think that I enjoyed doing tile work on the back splashes the most. I have done one big redo, a kitchen. 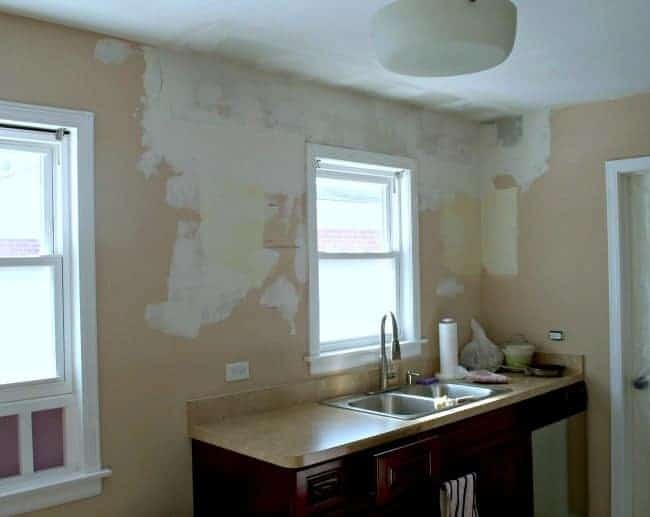 I hated painting the cabinets. 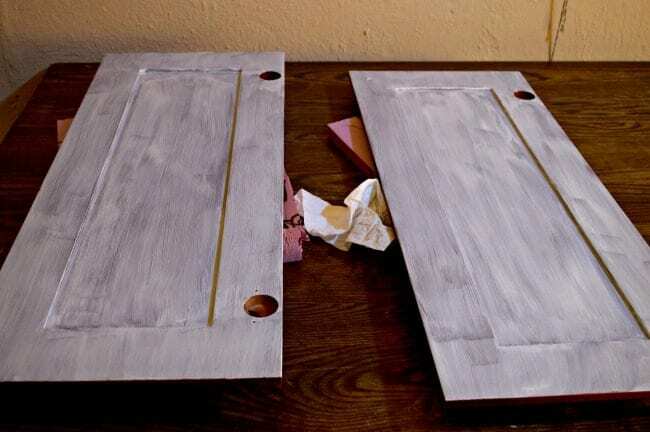 They were varnished and I decided to strip the varnish first. What a mess! I swore I would never redo cabinets again, and I haven’t. The last place that needed cabinets painted, they were golden yellow and blue, I paid a man to do them. 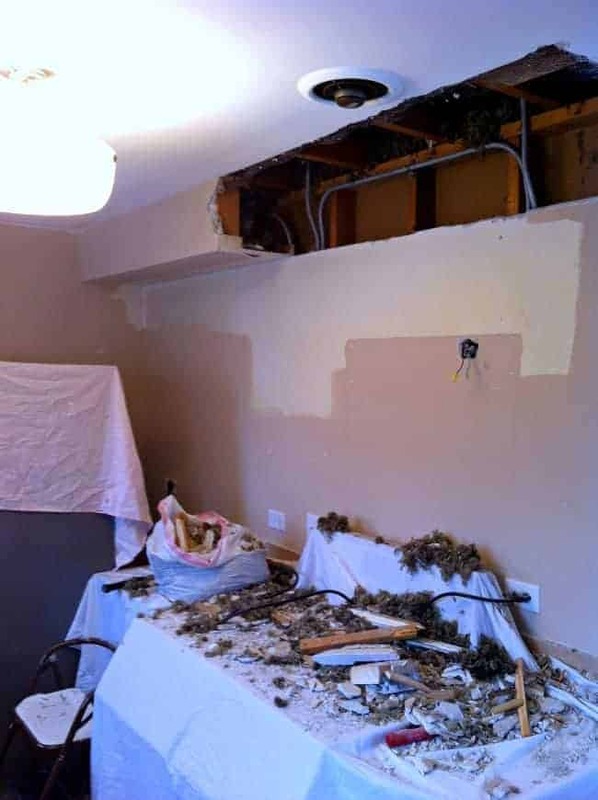 I have never removed soffits or ceiling so I give you kudos for your ambition. It will be beautiful when done though so worth the effort. I’m glad the soffits are gone but we are both worried about getting the walls smooth again. 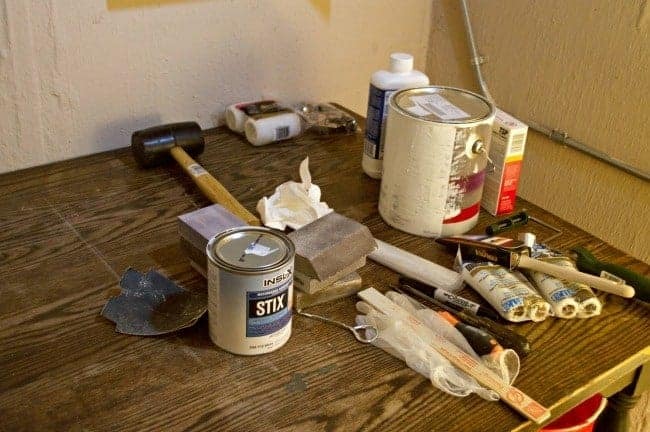 It’ll take lots of spackle and sandpaper. Hopefully we’re not sorry. Before you know it will be all done and you will be so happy! I know you have done your fair share of remodels MJ, and you’ve done way more than we are doing in this kitchen. I’m just glad I don’t have kids at home. To go through all this while trying to take care of your kids is, I’m sure, very challenging. Even though the walls aren’t done, and nothing is back up yet, it already looks bigger in there!! It’s so funny because everyone who’s visited did notice the too short soffit right off the bat. Yes, I did get to help with that ugly sucker. 🙂 I’m so glad that they are both gone. They were just too much for my small kitchen. Whoa, a big project indeed!! 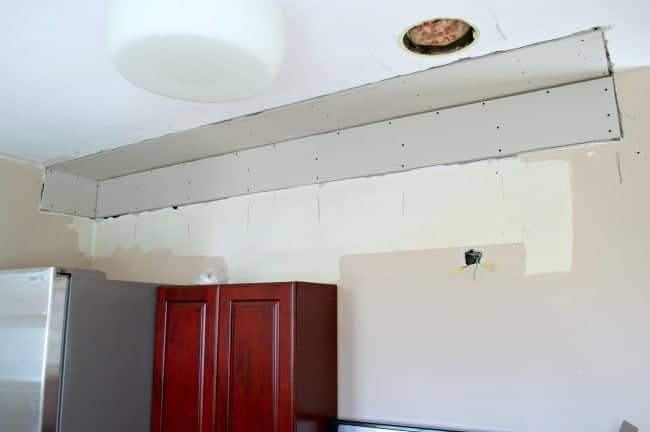 It sure opens up the kitchen with the soffits removed. Hope your cabinet painting goes great (I hate to paint, heh).